Just a progress update to let you know that we're still working on this project. We've been trying to get things ready as fast as possible but this week Dagger received an early deployment to Afghanistan. Please keep him and his family in your thoughts and prayers. Currently the rules are completely written and just need some minor edits and need to be "prettied" up (title page, etc.). I've been cutting out a complete army in one of the colors (desert tan) and it has been taking forever! And just when I thought I had cut out my last piece and I could edge and assemble, I realize that the "heads" of the Medium and Heavy Mechs are out of scale. Quick tinkering and test building has rectified this, but this means that all the miniature pages need to be re-PDF'ed. After this has been completed, I'll be taking product photos of the complete army (what it would look like to build just one printing of one of the colors) and a few color comparisons for the other colors. One set of rules, reference sheets, unit cards, and tokens. Light, Medium, and Heavy Mechs with equipment and weapons. Bases and Rubble Tokens for all miniatures in three different colors (OneMonk's Battlefield and Wasteland, and an Uncolored Set). In addition to all of this I'm also working on setting up our WEBSITE and forums for new rules, expansions, and scenario postings. Anyone have any good tips for Blogger? Thanks for the updates, I'm looking forward to purchasing this game. Also, will you be making the infantry available in 28/30mm scale? I would also purchase those. Any chance of getting someone to make some GSD files for you? At the moment, I'm not really worried about automatic cutters. I may include that in a re-release later. I've been really torn about formatting things to make automatic cutting easier. On one hand, the cutters seem to be gaining in popularity and would make cutting out parts a lot easier. But I can fit a lot more on a page and can make better layouts. For example: all the medium weapons fit on one page in large enough quantities to outfit all the medium mechs (that also fit on one page). If I shrink the page size to 7.5" x 9.5", you would have to print multiple pages to have enough weapons and then you would have a ton of left over pieces that you won't be using, not to mention all the wasted ink and paper. Hey WaffleM, would you like some GSD layout templates? I can send you the robomaster One-Monk master layout and the accompanying pdf that you can open in your paint program for layout work. It makes things a lot easier to convert later if they are laid out in a robo-friendly fashion from the start. edit> I should check my PM's more often. Sent! That would be awesome. Thanks! Do you have a vector version as I don't really use a paint program? Update: I've reformatted all the pages and added registration marks for future GSD consideration. Many, many, many thanks to Squirmydad for the templates and answering my pestering auto-cutting questions! Up next re-bitmapping all the pages (I work mostly in vector drawing and then convert files) and re-PDF'ing all the pages. I still have to finish edging the models for photographing and then I'll be on to finishing the final layout of the rules. Sounds awesome Waffle!! Look forward to getten my paws on it!! 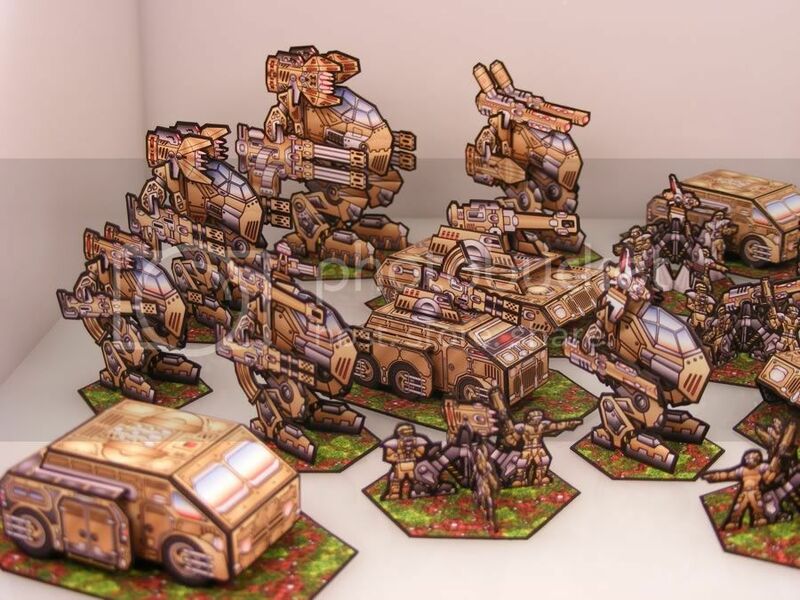 This is what it looks like to field one complete set of the tan mech miniatures. Of course you can always print more, but I wanted to show what one complete set looks like. Anyway I am one of your next customer. Very excellent work. Really excellent. PS: thanks for the birthday greeting. Excuse me but have seen the PM after a few days. Sorry. Very nice looking set. Excellent work on this!